Revesby CC 131, Hartsholme Sunday 1sts 134-7 - Hartsholme won by three wickets. 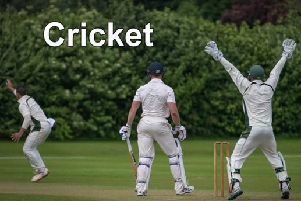 Revesby CC suffered a three-wicket defeat at Hartsholme in the Lincoln and District League Premier Division on Sunday. Ivan Nash (36), Robert Knight (29 not out) and Gordon lane (26) scored well as the away side were dismissed for 131. Lucas Cooling’s 48 helped Hartsholme to victory as they reached 134 for the loss of seven runs. Wickets were taken by Michael Ridding (3-12), Darren Hunt (2-24), Nash and Simon May.